Pro Expert Floss by Oral B is a relatively recent entry on to the dental floss market. It is actually a dental tape. That means it is relatively wide and flat compared to normal dental floss, which is similar in shape to a thread of cotton. Here are a few photos of Oral B Pro-Expert floss. You can see the thicker texture of the tape as compared to conventional dental floss. You can also see the conventional white color as opposed to my previous favorite, Blaque tape. I started using this dental tape alongside my favorite tape, Oral B Satin Tape. I used the Pro Expert tape one day, and Satin Tape the next, alternating each day. The slightly thicker feel of the Pro Expert product makes it easy to get hold of, and wrapping a couple of inches around each of my middle fingers, I was ready to go! At first, I thought the Pro Expert tape might be a little too thick to slip between my teeth easily. It certainly feels thicker than the Satin Tape. But it is also quite slippery, and I found that it popped between my teeth without any problems. Once in place between 2 teeth, it was easy to see, and easy to keep a grip on. The wax coating seems to help it grip my fingers more than other tapes or flosses. It moved up and down between my teeth with little resistance, and slipped under my gum edges nice and easily. Again, the tape looks thicker to the eye than the Satin Tape, but handles and behaves like a much thinner tape. 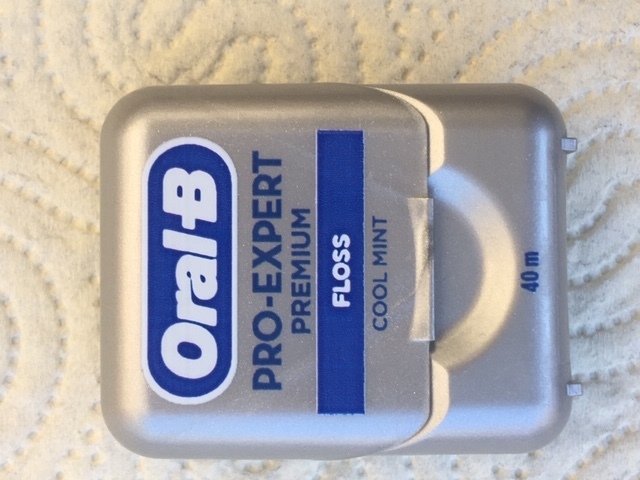 One thing I noticed about the Pro Expert Floss after a week or so of use; it is extremely shred-resistant. In fact, I can't recall it shredding once while I have been using it. Normally, when I'm flossing between a couple of particularly tight teeth, I can even get the Oral B Satin Tape to shred a bit, so I have to admit that I'm impressed by the performance of the Pro Expert product. It's a non-shred dental tape! I used to hate trying to get shredded dental floss out of between my teeth! I also found that the packet of Pro Expert tape seemed to last forever. 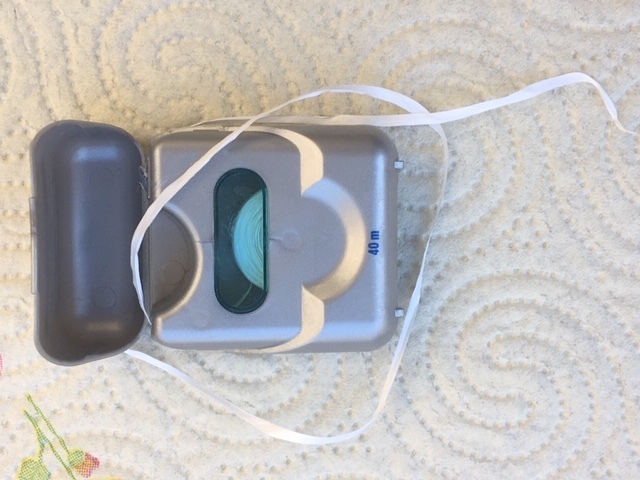 When I inspected the box a bit more closely, I found that it comes in a 40 meter roll, rather than the 25 meters that most other floss or tapes come in. That's almost double the length! The makers claim that the new tape is waxed and minted. From the way it seems to slip between my teeth despite it's thicker feel, that waxing process seems to work well, without excessive waxiness. In fact, the waxing level is SO LOW that you almost wouldn't believe that it's a waxed tape. The mint flavor is also very low-key. In fact, it's almost non-existent! Now, I'm 60 years old, so it's possible that my aged taste buds don't pick up flavors like they used to. But on a positive note, the mint flavoring is certainly not over-done or overly-strong. Overall, I've been very impressed with Pro Expert dental tape. As the weeks have gone by, I have found myself reaching for the Pro Expert product rather than the other dental tapes and dental flosses that I have lined up in my bathroom. 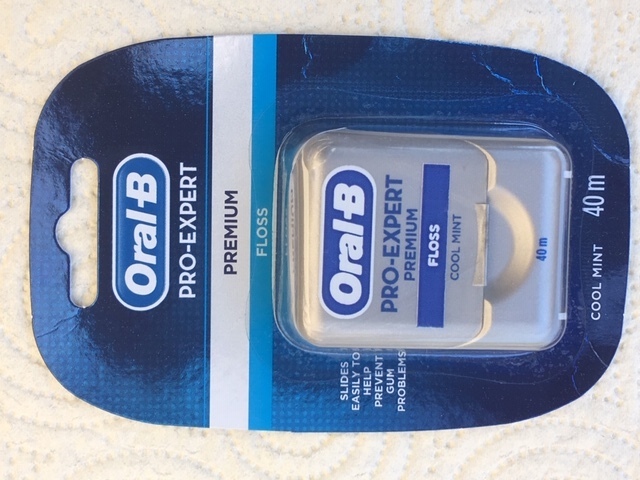 Oral B Pro Expert Floss is available from Amazon, and I recommend it very strongly as a great dental tape! I've reviewed other types of dental floss On This Page.